There is some suggestion in the literature that extruded nuclear material may be “drawn in” by the reduction of intradiscal pressures. This concept however is not uniformly accepted since the length of time the material stays ‘drawn in’ has not been established in controlled studies. However, a temporary reduction in intradiscal pressure can still have a profound effect on the healing process via increased contact with the blood supply and fibroblast migration (so called phasic effects). This is in addition to the pain relief created neurologically by stretching soft tissue (e.g. stretch receptors, mechanoreceptors etc.) 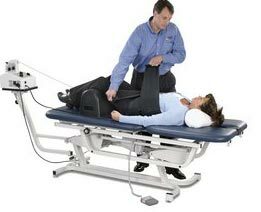 make decompression therapy a logical and viable addition to a “passive” pain care regiment.